Ghosts push aside alien abductions, werewolf infections and nightclubbing vampires to become the sole element of the occult in The Sims 3. There's always something supernatural in every Sims game. From werewolf babies in the Sims 2 Pets expansion all the way back to alien abductions in The Sims (which did not result in pregnancy), producers have slipped something strange in to make gameplay that much more interesting. Sims 3 Associate Producer Grant Rodiek is no exception. One of his many pet-projects in the game is the "playable ghosts" Opportunity. Opportunities in Sims 3 are like mini quests – they appear every so often in one of the Sims' sub-menus as optional tasks your Sim can complete to earn special bonuses or rewards. Rodiek wouldn't go into too much detail on how the Ghost Opportunity worked, but he said completing it was a walk in the park compared to how hard becoming a werewolf was in The Sims 2. As a consolation, he took a sim to the town graveyard to show me another facet of the ghostly occult in Sims 3. 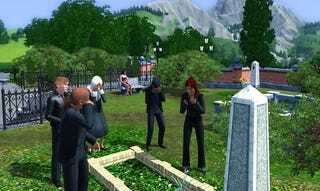 You can send a sim into the stone mausoleum the way you would send them off to work in The Sims 2. Text options will pop up, letting you choose what your sim should do down there in the dark catacombs. Good things might happen, bad things might happen; or, he hinted, your Sim might not make it back.